When radio reporter Chris “Magnum” Chapman got wind about a Vegas Golden Knights-themed wedding, he immediately thought of the best man to ask for a response. 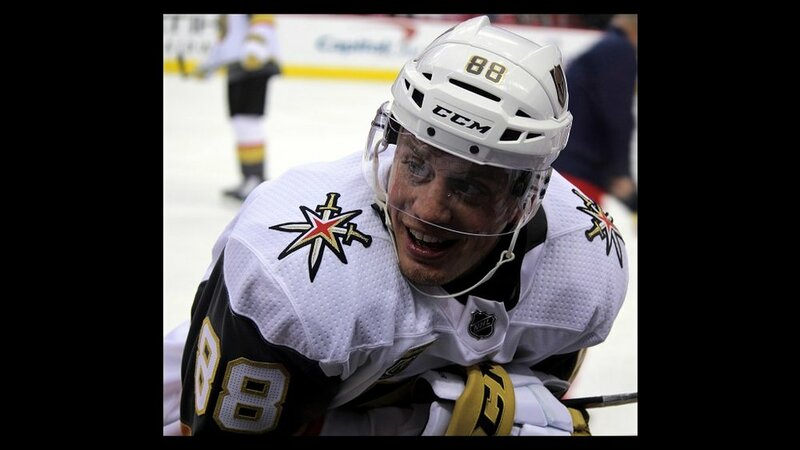 After seeing the wedding announcement on Facebook, Chapman, who excels at delivering the off-beat side of sports for Fox Sports 98.9 FM and 1340 AM, went to defenseman Nate Schmidt, the Knights’ gritty, witty quote machine. The wedding ceremony has to include a “shiney gold coat, very sparkly, maybe bedazzled in a way,” said Schmidt. “And maybe have a cake you pull the sword out of,” said Schmidt, referring to the Knights’ pre-game ritual at T-Mobile when a man dressed as a Golden Knight removes a sword from a rock and vanquishes a rival representing the opposing team. And who would be Schmidt’s choice as the Knight most likely to crash the wedding? Starting tonight (Thursday), the Golden Knights will host the Sharks for the first two games of the second-round series before heading to San Jose for Games 3 and 4. JOSH ROSEN: UCLA’S FALLING STAR? NFL Network analyst Mike Mayock revealed his mock draft on Wednesday and this opinion of UCLA quarterback Josh Rosen might be the biggest shocker. Mayock has Rosen, a top-five pick on many high-profile draftniks’ lists, sliding all the way to the 15th spot, with the Arizona Cardinals taking him. As recently as March 30, ESPN’s longtime draft guru Mel Kiper Jr., had Rosen going third to the New York Jets. 1. Cleveland, quarterback Sam Darnold, Southern Cal. 2. New York Giants, running back Saquon Barkley, Penn State. 3. Jets, quarterback Baker Mayfield, Oklahoma. 4. Cleveland, pass rusher Bradley Chubb, North Carolina State. 5. Denver, offensive guard Quenton Nelson, Notre Dame. 6. Buffalo (trading up), quarterback Josh Allen, Wyoming. 7. Tampa Bay, safety Derwin James, Florida State. 8. Chicago, linebacker Roquan Smith, Georgia. 9. San Francisco, cornerback Denzel Ward, Ohio State. 10. Oakland, offensive tackle Mike McGlinchey, Notre Dame. Mayock has the Los Angeles Chargers taking defensive lineman Da’Ron Payne of Alabama with the 17th. UTEP offensive lineman Will Hernandez of Chaparral High in Las Vegas is projected to 30th, to the Minnesota Vikings. In a series of moves announced April 19 at ABC affiliate KTNV-Channel 13, Todd Quinones has replaced veteran evening anchor Steve Wolford, who departed after 13 years. Quinones joins Tricia Kean on the 5 p.m., 6 p.m. and 11 p.m. newscast. Dayna Roselli has joined Beth Fisher on “Good Morning Las Vegas” from 4:30 a.m.-7 a.m. Roselli is a holdover on the 11 a.m. “Midday” show in a solo anchor role. Justin Bruce is the “Midday” meteorologist. During a recent trip to my old stomping grounds in Denver, I was in the Colorado Rockies dugout for a pre-game interview when a young woman introduced herself. Her name is Jenny Cavnar and you’ll be hearing a lot about her in the future. What she didn’t tell me during our quick chat was that she was about to make history. On Monday, she became the first woman since 1993 to do televised play-by-play for a major league team. She joined analyst Ryan Spilborghs, an ex-Rockie, in the booth for the Rockies-Padres game at Coors Field. She had previously worked as a pregame and postgame host for Rockies telecasts on AT&T SportsNet since 2012. Golden Knights goalie Marc-Andre Fleury, with his family at Blue Man Group last Friday. “A hostile workplace, prescription drugs, and day drinking? On the bright side, today (former White House doctor) Ronny Jackson was named as one of the new housewives of Beverly Hills.” – James Corden of “The Late Late Show with James Corden.